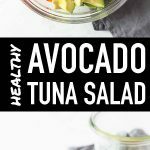 The best recipe for a creamy, fresh, delicious and nutritious Avocado Tuna Salad. 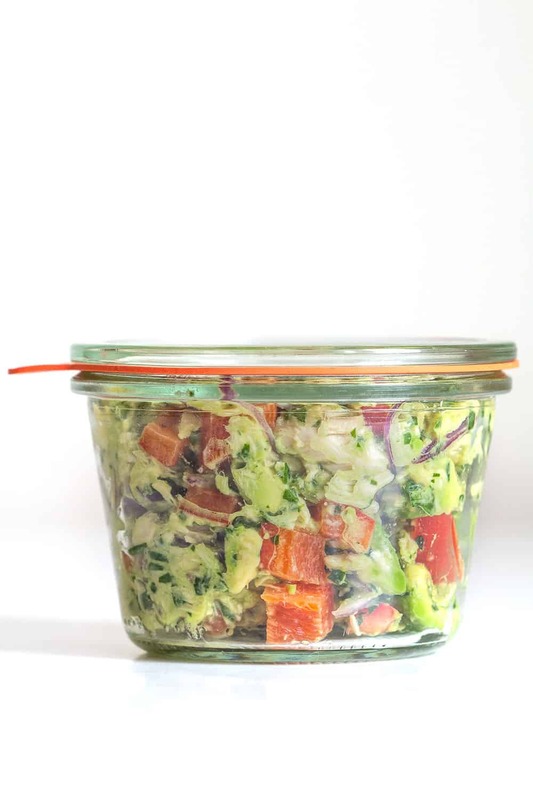 10 minutes of work and you’re rewarded with one of the most delicious easy salad recipes ever! I’ve been an avocado fan ever since I was introduced to food as a baby! My mother is Peruvian and despite raising me in Germany in the 80s, where Avocados were like 5 bucks a piece, she always had some on hand for us kids to eat. They are such a delicious fruit, I can’t imagine not having them reasonably priced available at all times everywhere I live. And without getting too political over here, I just want to say thank you modern world for making this happen. After working on a super yummy Avocado Chicken Salad it was clear I had to create MORE avocado salads. I am now actually working on a whole series. Next up it’ll be an Avocado Cucumber Salad because, that one can’t be missing in my series either. For today, let’s just focus on this amazing Avocado Tuna Salad though. Sooo creamy! A real delicacy! You obviously need to find the perfect avocados!! Even after years of practice I still sometimes get tricked by one that seems to be perfect but isn’t at all. There are tons of tutorials on how to choose them but in the end it’s all about experience picking them out. You just have to touch and feel them from the outside right before you cut into them so you know what they’ll look like when they feel certain ways. This tuna avocado salad tastes great with ripe but firm and with very ripe avocados, too. I prefer very ripe ones (as seen in video) because it makes it extra creamy, however, it’s pretty forgiving on the ripeness of the avocado. We can’t always plan lunch or dinner around an avocados ripening process, can we? If you find a rock hard one and it is ripe but firm by Monday when you need it, don’t push making this salad more days if you can’t just because of the avocado. If you CAN push it, push it another day. So much creamier with very ripe avo. Just keep an eye on your fruit so it doesn’t go black before you know it. This can happen SO FAST. You can obviously cook your own tuna but this not only makes cooking time longer but kind of is a waste of a delicious ahi tuna steak which taste so much better half raw. There are very few canned foods in my pantry but those I use a lot and regularly in my kitchen. One of them is flaked white tuna in water. 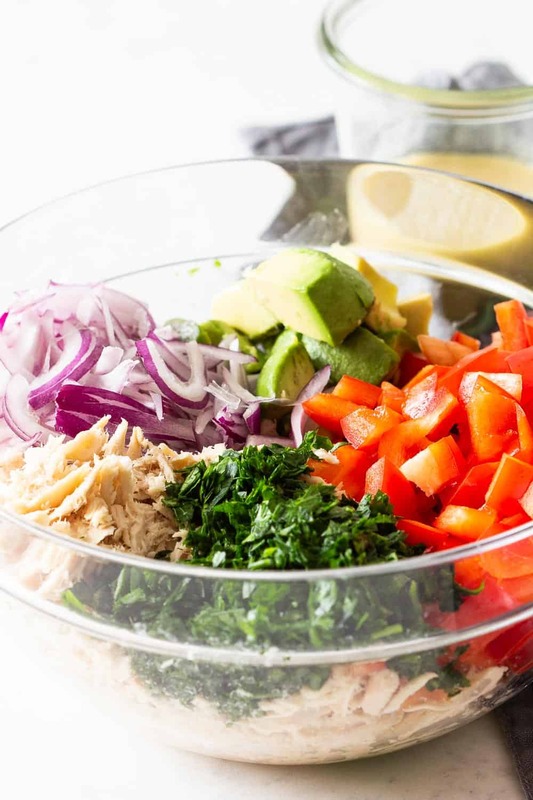 For this Tuna Avocado Salad we’re using a delicious extra virgin olive oil, so choose tuna in water. I drain the tuna in a colander before using so it doesn’t water down my salad dressing. 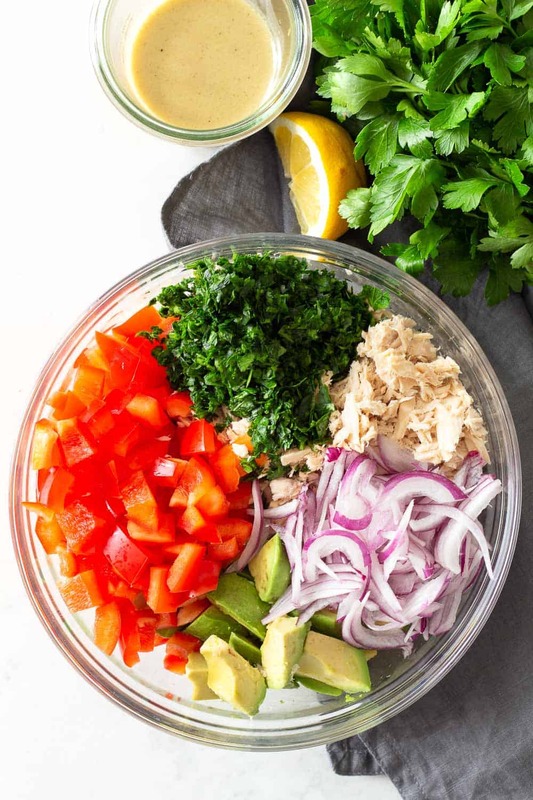 Diced avocado to a bowl, drained tuna, some crunchy and sweet and delicious veggie such as red bell pepper, oniony spice from a red onion or scallions, a LOT of parsley and a delicious olive oil lemon dressing is all you need. It’s literally a 10-minute process. All your have to do is wash and chop your veggies and avocado, drain the tuna, prep the dressing and toss it all. Using avocado for meal prep recipes is tricky because avocados brown so fast. There are two tricks to the situation. 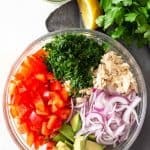 If you want to meal prep this Avocado Tuna Salad for lunch the next day, make it as late as possible in the evening and toss the avocado alone in the dressing first so it’s completely covered, then add the rest of the ingredients and toss together. The lemon in the dressing will help keep the avocado from browning. If you want to meal prep on a Sunday for the week, mix all the ingredients and dressing in a bowl EXCEPT the avocado. Keep the avocado as a whole on your counter until it has the perfect ripeness and once ripe store in the fridge. Add the avocado right before eating your salad. Make sure you bring a knife to work (if there is no kitchen at the office) and cut it into the salad right then right there. An avocados skin is the best protection for the fruit to not get brown. 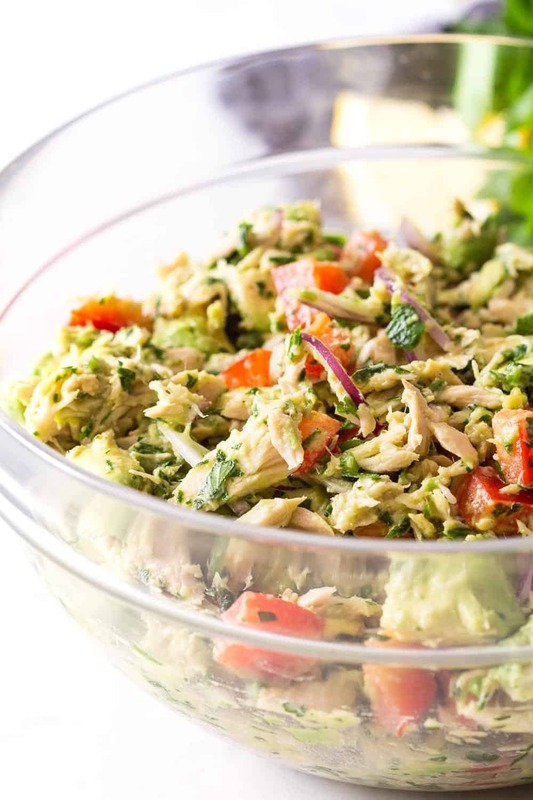 The best recipe for a creamy, fresh, delicious and nutritious Avocado Tuna Salad. 10 minutes of work and you're rewarded with one of the most delicious easy salad recipes ever! Half, destone and peel avocado, then cube and add to a large mixing bowl. Drain tuna well and add to mixing bowl. Wash, deseed and finely dice bell pepper and add to bowl. Wash and shake dry parsley, then chop finely and add to other ingredients. Peel and slice onion and add to bowl. In a air-tight sealable container add dijon mustard, juice of whole lemon, olive oil and sea salt and pepper to taste, then shake until well combined and pour over salad ingredients. For meal prep instructions refer to blog post above. Wonderful. I used the Avo-Tuna salad in a lettuce wrap and it was wonderful. Probably would also be good with a tortilla wrap as well. Wondering how long it will stay fresh? Wanted to make for my daughter to take to school at 8am but to eat at 6pm – music rehearsals until late. I put a ice block in her insulated lunch bag but we’re in Perth, Australia and it’s often over 35 degrees fahrenheit at the moment. 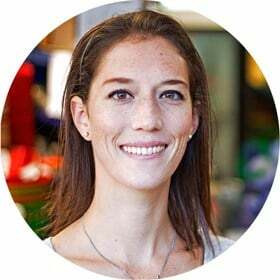 Hi Stephanie, if she doesn’t mind that the avocado oxidizes a bit it “might” be fine. The most important is to store in an air-tight container and maybe put in several ice blocks just in case. Mostly because of the Tuna. Tuna can be tricky if not refrigerated. Any animal protein is risky if not stored properly.